Earlier this week, AMHO CEO Adrienne Spafford and Vaughan Dowie, CEO of Pine River Institute and member of AMHO’s Board of Directors, presented to the Standing Committee on Social Policy on Bill 74 — The People’s Health Care Act. AMHO was selected out of over 1,500 applicants to present our perspective to the committee on proposed health-care reforms. AMHO took this opportunity to relay to the committee what we have heard from our members at our regional meetings across the province. We made it clear that community mental health and addiction service providers must play an integral role in the formation of Ontario Health and Ontario Health Teams. Community-based mental health and addiction providers must play a central role in the delivery of mental health and addictions care through Ontario Health Teams. Ontario Health Teams must focus on providing Ontarians with continuity of mental health and addiction care across the lifespan, from children and youth to adults and seniors. 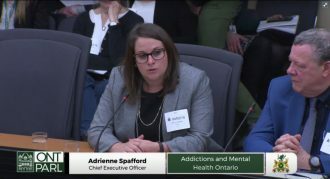 Ontario Health must identify, adopt, and implement a standardized set of core services for addictions and mental health care across the province. Ontario Health must focus on the implementation of a strong data strategy for community-based mental health and addiction care, so that the level of care provided through Ontario Health Teams can be measured and maximized. Ontario Health must establish a baseline of funding to community mental health and addiction service providers and must commit to both protecting and growing these funding levels to support capacity building within the community mental health and addiction sector. Together with our member agencies and partners, AMHO looks forward to continuing to work with government on building a more patient-centric health-care system.